After having braces, there has been thing that I am always making sure of - how good my teeth look. The bottom ones are still a bit uneven, but the top are straight - in my opinion straight teeth doesn't mean everything! 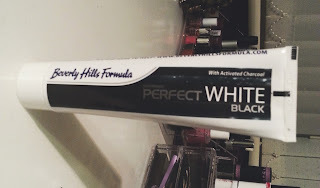 You need to have some white sparkle as well to really make them stand out and for people to go 'WOW You're teeth look amazing' and that is exactly what I have had with this black toothpaste* from 'Beverley Hills Formula'. At first I was terrified to use it because the colour put me off, but then once you toughen yourself up and start brushing with it turns into white paste and has a minty flavour that is lovely in your mouth. I have found that after using this every morning for one week before school, my teeth have never been better! The activated charcoal coats your teeth and removes any bacteria from forming which then leaves your teeth looking white and fresh! Beverly Hills Formula have so many other products that you can try out, to see which is best for your teeth type. I have very sensitive teeth that I struggle with things like ice cream, and this has worked on my teeth better than any other sensitive toothpastes you can find. You can buy this is Superdrug for around £4.99 which is so much cheaper compared to the other pastes that claim to give you a white smile. If you want to achieve that 'hollywood' smile the right way, then I suggest giving this wonder tube a wiz and see whether or not you are a fan. I hate toothpastes that are minty, but this isn't unbearable and actually smells amazing! 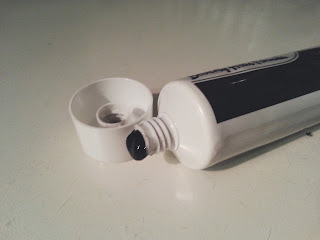 Thanks for sharing this review about Perfect White/Black Toothpaste. It's seems like so cool.